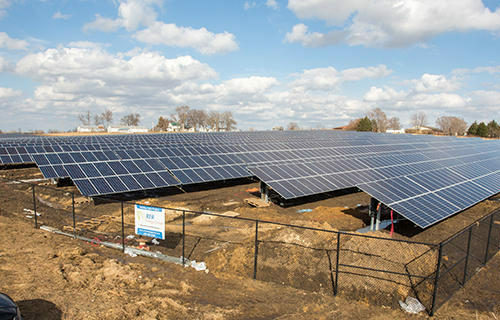 The 1.5MW community solar project came online near Prairie Lakes Park in Cedar Falls, Iowa, thanks to the work of a dedicated team of visionaries at Cedar Falls Utilities, the 1,200 Cedar Falls Utilities (CFU) customers who invested in the array, and the tireless efforts of RER Energy Group and Sunvestment Energy Group (SEG) to bring the project to fruition. “RER and SEG made the development simple, from project design to installation and financing,” said Michael Maulick, CEO of SunLink, which provided the solar racking and helped with the installation. CFU did a terrific job in building excitement for this project in their community. In fact, so many CFU customers decided to participate that the solar unit price was reduced by nearly one-third, from $399 to just $270. Customers who purchased units will receive a monthly credit on their CFU electric bills for 20 years based on the output from the solar panels. What’s more, 100% of the clean energy from the solar array will be used in the Cedar Falls area, making this a true community project. “RER is pleased to help provide a community array to the people of Cedar Falls that will not only provide savings benefits for the next few decades but also create a cleaner environment for the entire community,” Kurtz said.